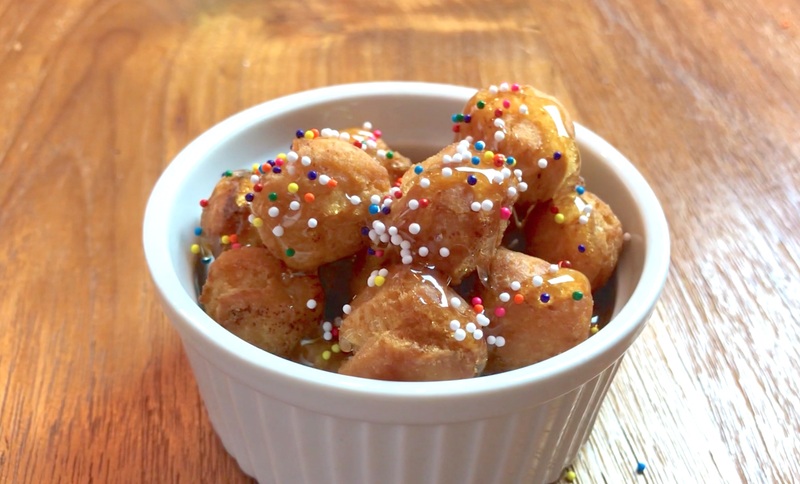 Have a BALL with Struffoli! It’s been a baking, working, crazy week! But we’re finally at the weekend, which is being capped off this year with Christmas Eve! Wooooo hooooo! And there’s still time to get all your baking in. For us, it’s not Christmas without delightful honey-strewn struffoli!!! 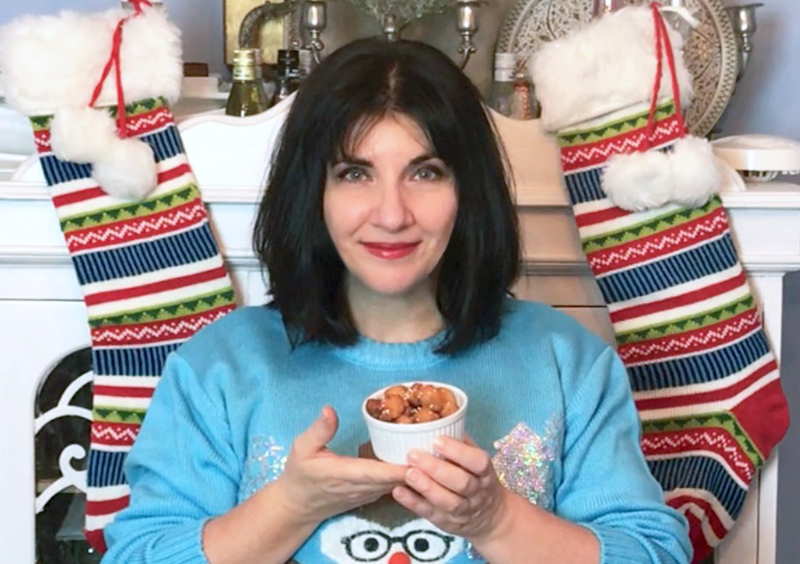 If you’re familiar with struffoli, you’re likely used to the version where the struffoli are arranged and then drenched in simple syrup and honey then the nonpareils are applied. It dries into a sweet, hard TOWER. I am NOT A FAN of those. They are way too sweet, messy, and taste stale. This is another recipe my mom shared this year. She’s always fried the little balls and kept them in a cookie tin. When it was time to serve them, she’d spoon them out and THEN apply some honey and nonpareils, bringing both the honey and the little colorful sprinkles to the table so everyone can doctor up their own serving as they like. I like the fresh taste of honey with the golden brown fried little dough balls. The touch of color and extra sweetness of the nonpareils is the perfect bite of Holiday goodness! OK – baking is DONE! I’m heading to the stores to do my Christmas shopping – not last minute though… this is always the plan! I love the hustle and bustle of this moment to find some glorious gifts! I’ve got some decadent sweet recipes to end the year for you next week. Until then, I’ll be prepping a wonderful plate for Santa. He’s going to leave me a LOT of good stuff when he tastes these struffoli! 🙂 Haha…. er… umm… HO HO HO! Combine sugar, eggs, vanilla, butter, and baking powder. Add flour gradually, creating a dough. Wrap in wax paper and refrigerate for an hour. Cut dough into about 20 pieces. With your hands, roll each piece into a rope about 1” thick. Cut it into about 1” pieces. Repeat with all the dough. In a sauce pot, heat oil to about 360°. Add struffoli a little at a time and fry until golden brown. Remove to paper towel-lined plate to cool. Spoon into dish and add honey and nonpareils as you like. Yes they are and right you are! They came later but are officially are chocolate nonpareils as in chocolate with nonpareils. Nonpareils are “a decorative confectionery of tiny balls made with sugar and starch”. We made fun use of mini chocolate nonpareils, or by brand name “Sno-caps” candy, in our homage to Game of Thrones, Game of CONES – https://www.youtube.com/watch?v=U1sjqFX8ANg! Happy New Year! « Tarting It Up with Mini Fruit Tart Cookies!